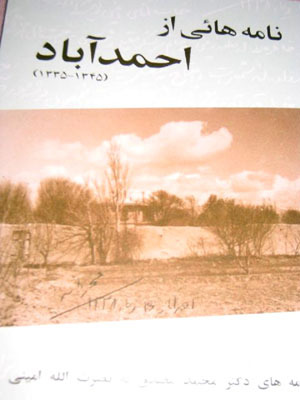 Namehha-i az Ahmad Abad, Letters from Ahmad Abad (1956-1966) is a collection of letters, sent by Prime Minister Mohammad Mossadegh to Nosratollah Amini, his personal attorney and confidant, during his years in exile from his estate in Ahmad Abad, located some 30 kilometers from Tehran, near Karaj. When I visited Ahmad Abad in the summer of 1384/2005, I was saddened and heartbroken by its appalling state. 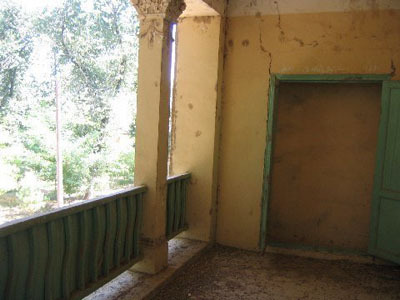 The Bassij had ruined the roof of the house after an earthquake had done some major structural damage. 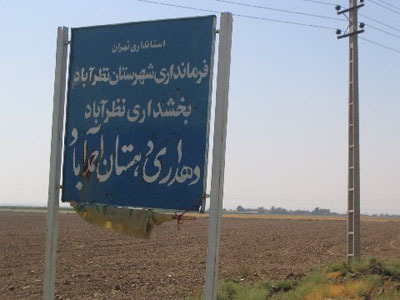 The caretaker of Ahmad Abad told me that in 2001 Khatami’s minister of Ershad (culture) had visited the place, and had acknowledged the fact that major work needed to be done, but that four years later no one had returned. 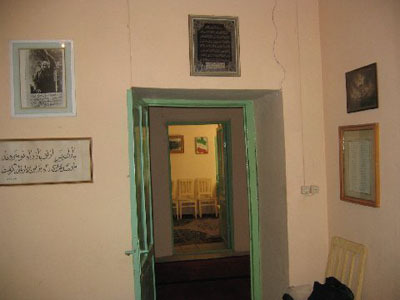 Ahmad Abad was where Dr. Mossadegh lived intermittently and where he was finally exiled by the Shah, his last wish to be buried near the tomb of the martyrs of 30 Tir having been rejected by Mohammad Reza Pahlavi. <?xml:namespace prefix = st1 ns = "urn:schemas-microsoft-com:office:smarttags" />Iran. Throughout his life and following his death, both the Pahlavi regime and the Islamic Republic tried in vain to banish his name from the pages of history. Nosratollah Amini was the mayor of Tehran during Dr. Mossadegh’s premiership, and the first governor of Fars following the Revolution, who resigned his post after personally delivering his resignation to Ayatollah Khomeini. 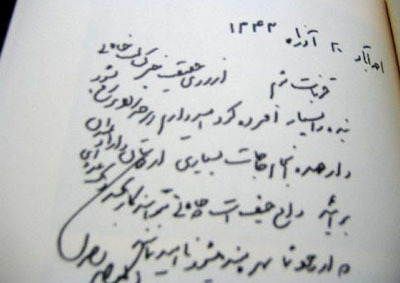 In the brief month of his tenure as governor, he abolished the Komites in the state of Fars; he stood up against the misuse of power, and after hearing that Khalkhali and his thugs were set on destroying Persepolis for being a symbol of decadence, he called on the security forces to resist the invaders. 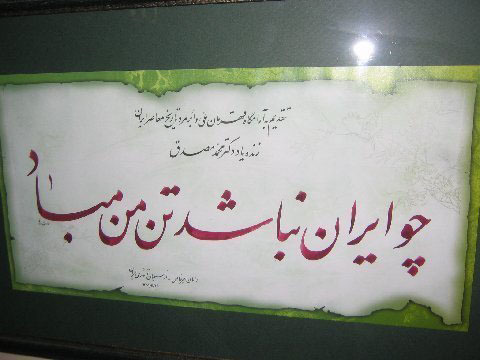 Amini’s defiant words, “you will destroy Takhteh Jamshid over my dead body,” remain legendary. Dr. Mossadegh’s letters have been published here in their entirety, compiled and edited by Fariba Amini, with explanatory notes by Mr. Amini. The content of the letters as well as the accompanying photos reveal the close and amicable relationship not just between a client and his lawyer but two men who had enormous respect for one another. 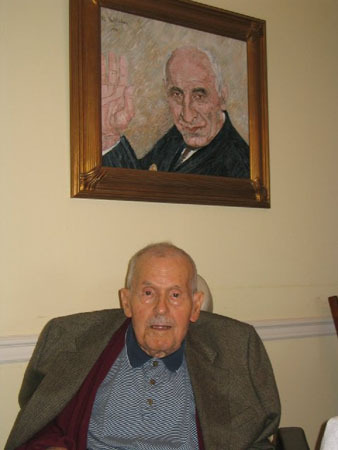 Nosratollah Amini who is now 90 years old is one of the last remaining members of the original National Front created by Dr. Mossadegh.